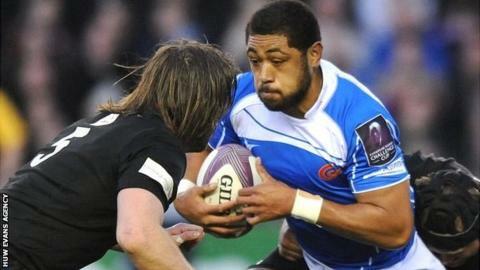 Taulupe Faletau's proposed move to Bath is now in the hands of the Welsh Rugby Union, says Bath head coach Mike Ford. The British and Irish Lion has long been linked with a move to the Rec. An issue over the 24-year-old forward's availability to play for Wales now appears to be the only stumbling block to his arrival in the Premiership. "Nothing is sorted out and we won't say anything else until he has signed. It's in the Welsh Rugby Union's hands and we'll see where that goes," said Ford. "It's all about release from Bath's point of view, the Welsh Rugby Union want full release before they can consider it," Hazell said. "We wouldn't like to lose him as a team but sometimes financial things pressurise you. But I can't see him going to Bath now and he doesn't want to go anywhere else. "When he's out of contract (in 2016) we can't say what he wants to do. That's his decision and the WRU's decision." Speaking to BBC Radio Bristol, Ford added: "Recruitment never stops - we are looking at other players as well for this season. We're nearly finished but one or two more would be good." In May the WRU withdrew its offer of a national dual contract to Tonga-born number eight Faletau after he missed a deadline. He has a year left on his current Dragons deal. However, national coach Warren Gatland has said Faletau's Wales career would be "protected" should he leave Dragons for Bath. Under the so-called 'Gatland's Law' selection policy, Wales-based players are likely to be favoured for Test selection over those who choose to play elsewhere, but the Wales coach said that as Bath have come in for Faletau, his international career could continue. "We are after world-class players," continued Ford, whose side lost to Saracens in last season's Premiership final. "We are playing in two competitions, we've got a great European group, and we are trying to create a world-class squad where we have two international players in each position. "We feel we need that to compete in both competitions. Will we get there this year? Probably not, but over the next few years we hope to get that without losing our home-grown talent."